$34.36 $42.95 As Low As $0.18 ea. 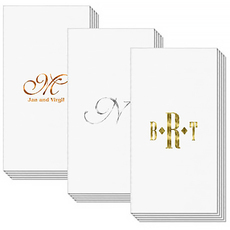 Set of luxurious DeVille napkins with a linen-texture finish. These are disposable excellent weight paper napkins with a nice superior finish and are absorbent. Approximate size 5 inch square. 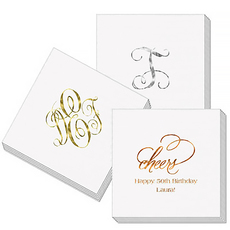 Your personalization will be imprinted in your choice of imprint color on these white napkins. You select personalization style and positioning. Napkins are shrink wrapped in sets of 50.